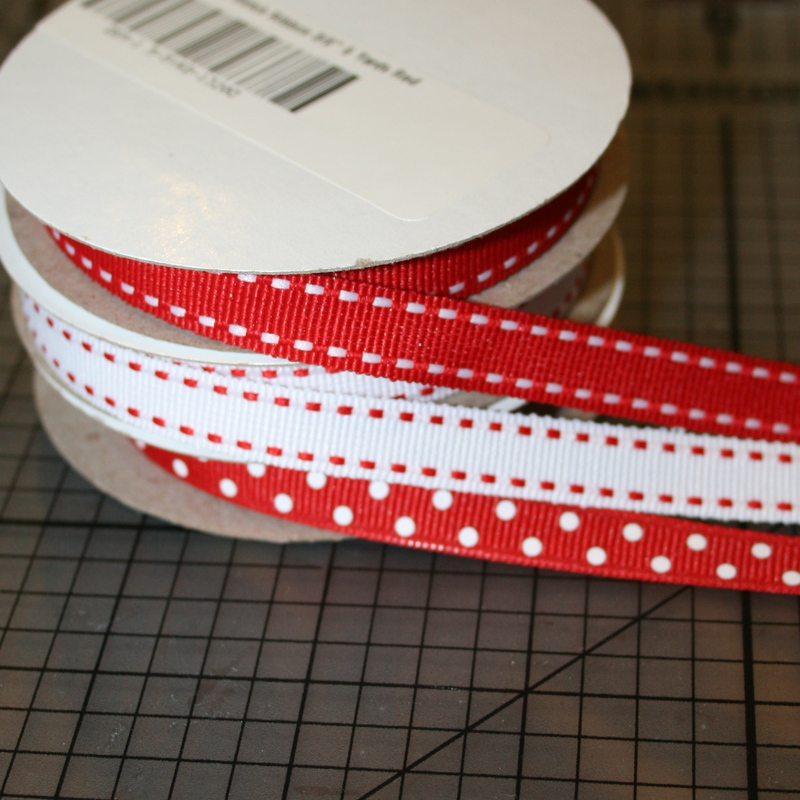 3/8 inch grosgrain ribbon: FIVE strands that measure 8 inches and FOUR strands that measure 6 inches. 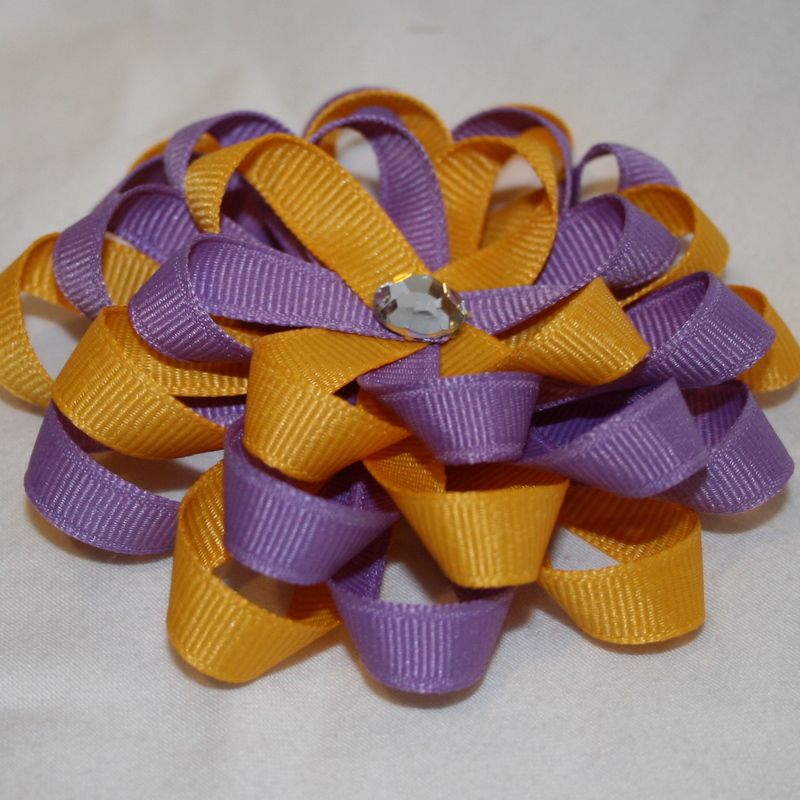 You can mix and match the ribbon- they can be all one color or lots of colors! 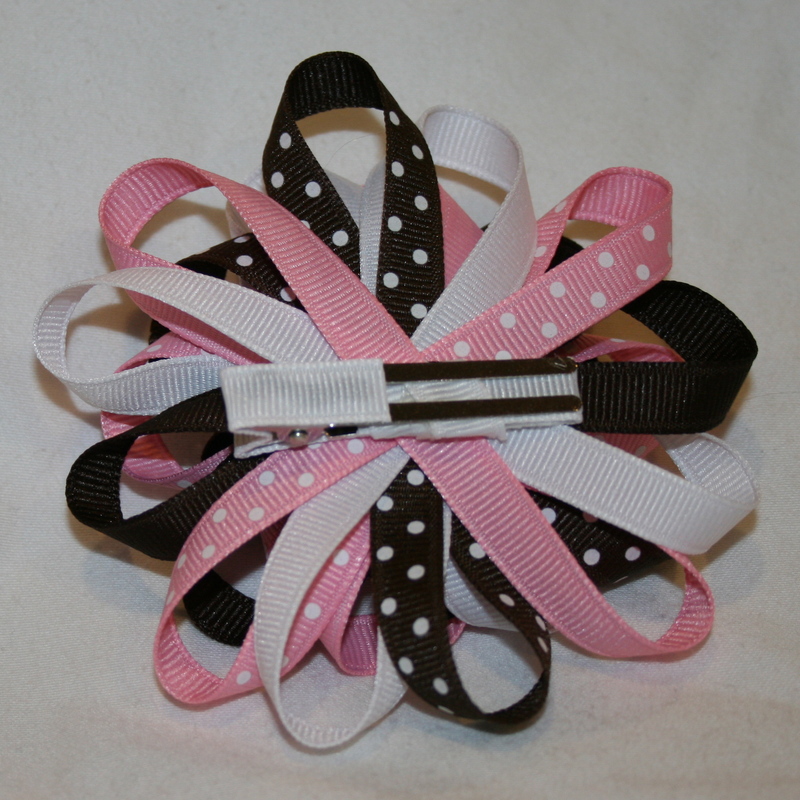 Be creative with your ribbons and have fun with it. The total amount of ribbon is 64 inches. 2x double prong alligator clip (one lined, the other unlined). One will be use for the bow and the other is a tool you’ll use. Select your ribbon. 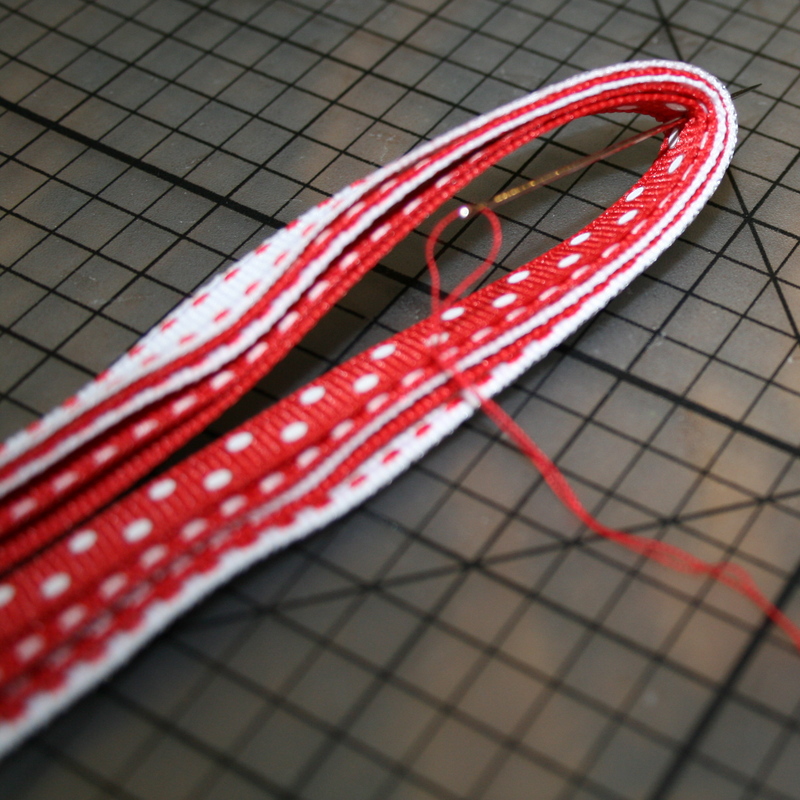 I have used red saddlestitch, white with red saddlestitch and red with Swiss dots. 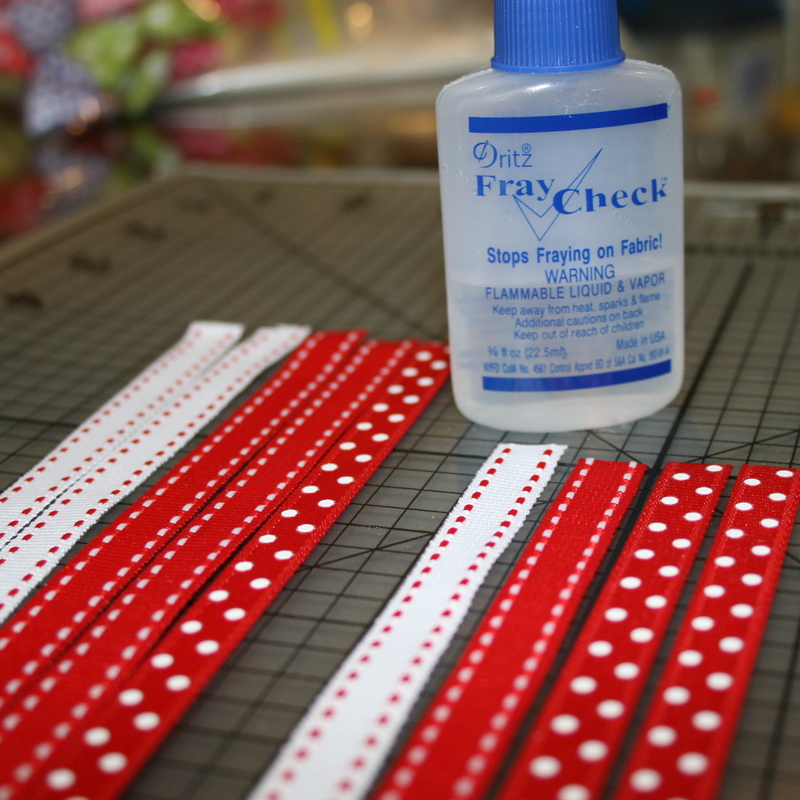 Cut your ribbon and treat all ends with Fray Check to prevent fraying. For a double layer medium sized loopy bow, you will need five strands that measure 8 inches and four strands that measure 6 inches. Your finished bow will measure approximately 3 1/2 inches. Stack the five strands that measure 8 inches then fold over in the center. Make sure your Swiss dots are facing towards each other as shown in the photo. Put your needle in the center of the fold. Do not pull the needle all the way through! 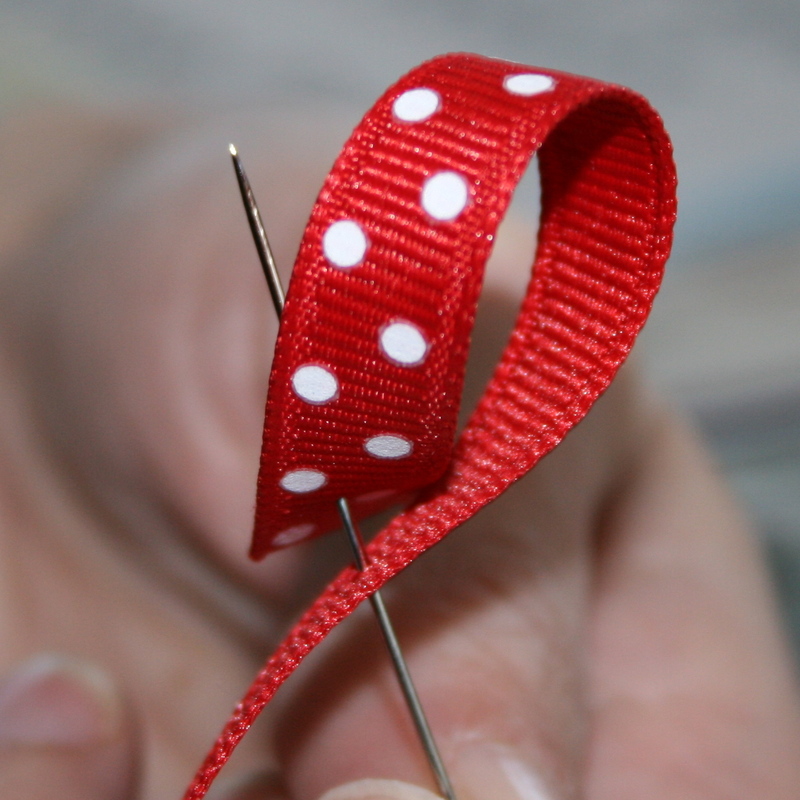 You need to stop when the ribbon is approximately half way on to the needle. Fan the ribbon taking care to keep the strands evenly spaced out. 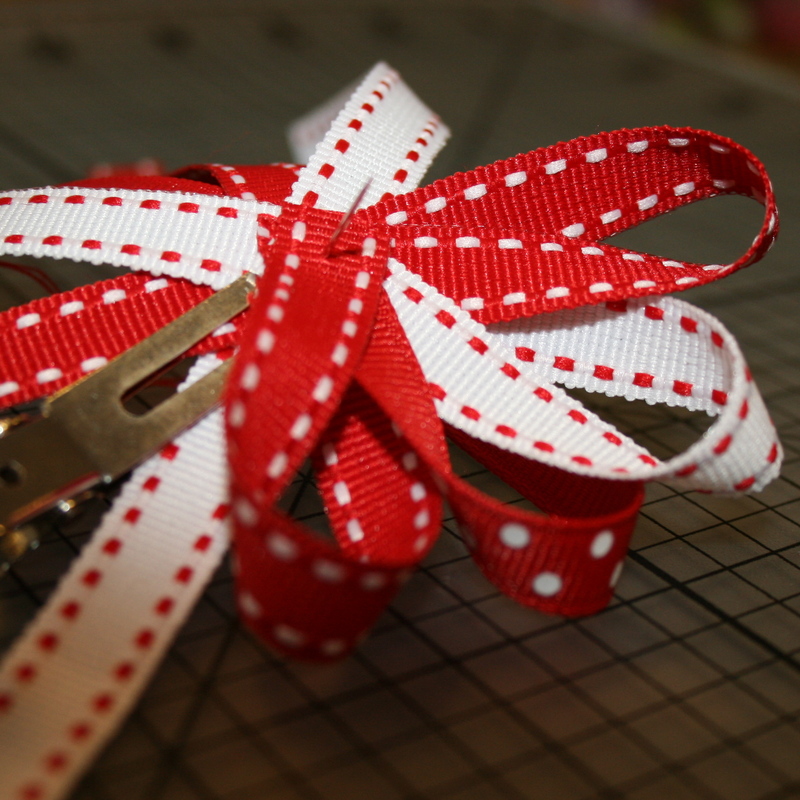 Take your time with this to get the ribbon exactly where you want it. It helps to hold the bottom of the needle with your dominant hand and then slowly move the strands around. Then, use a double prong alligator clip to keep the strands in place. Do not remove the needle. Start folding each strand. Take the end of each strand and turn it upside down before placing it on the head of the needle. This is called an inside-out fold and will give you nice loops. There are other ways to do the loops- the important thing is to be consistent and each loop has to be made the same way. One you have done all the strands, you’ll have a pretty flower shape. 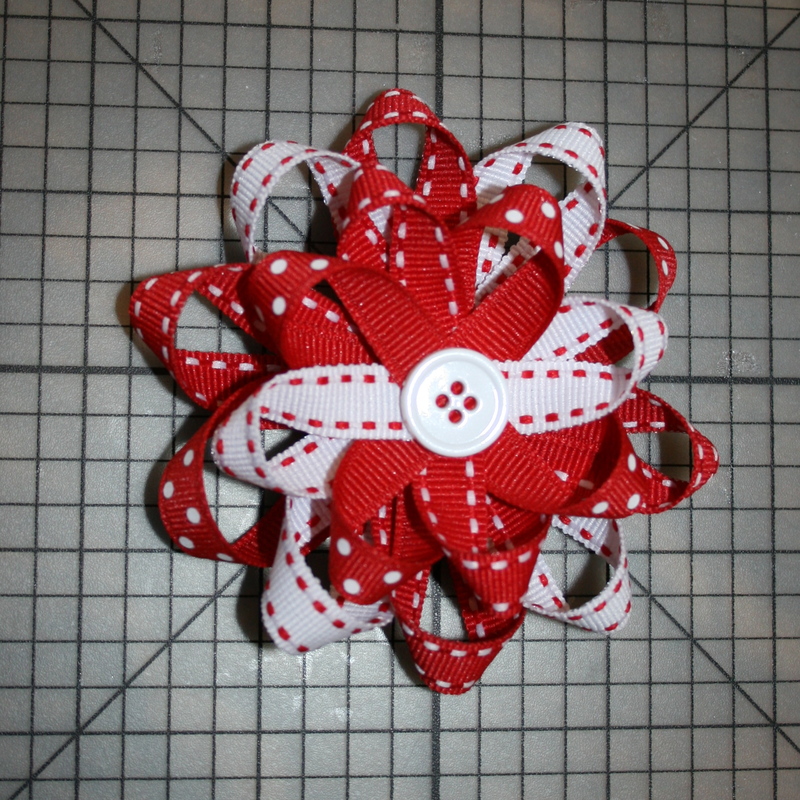 Use your needle and thread to sew the center securely. Usually I have to pull the needle through about 4 to 5 times. Then, cast off. 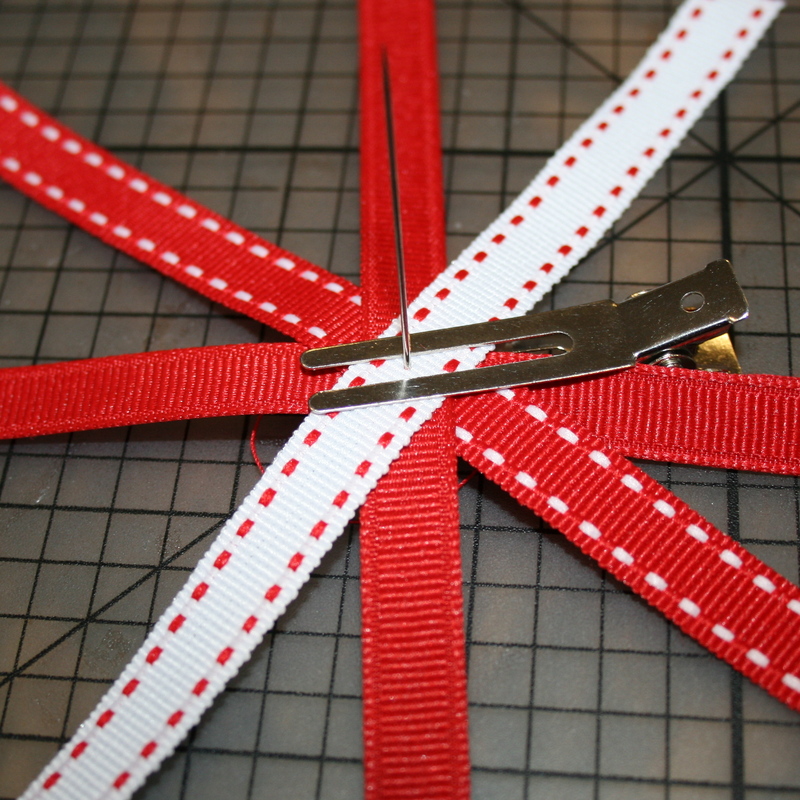 Repeat the above steps with the shorter threads of ribbon. 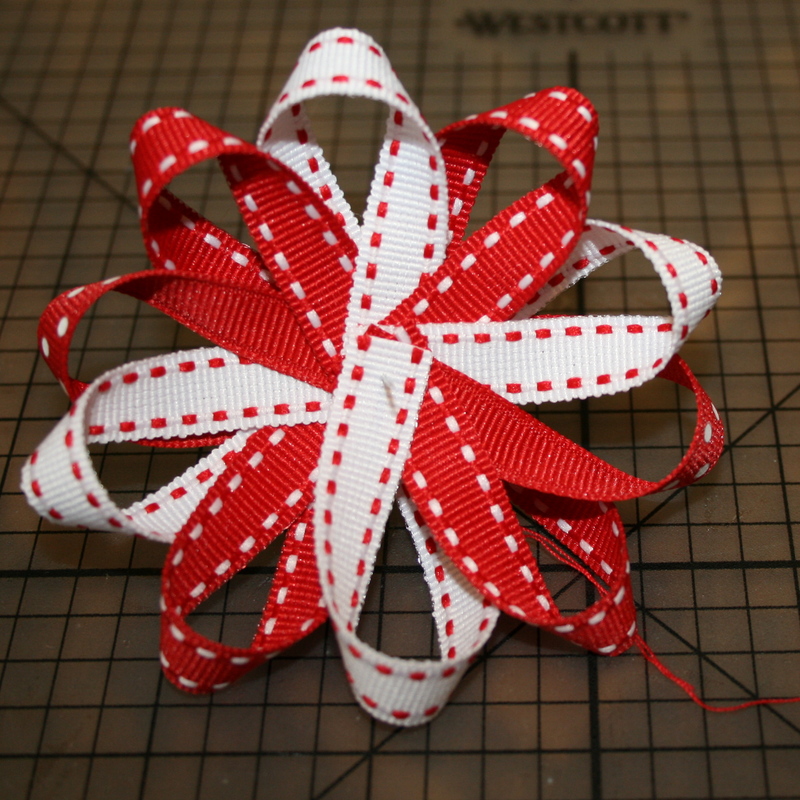 You’ll notice that it is easier to fan out the ribbon when you only use 4 strands. You now have two loopy flowers. You can either sew the top layer onto the larger bottom layer or use hot glue. I have used both methods and after breaking several needles, I have become a huge fan of the hot glue method! 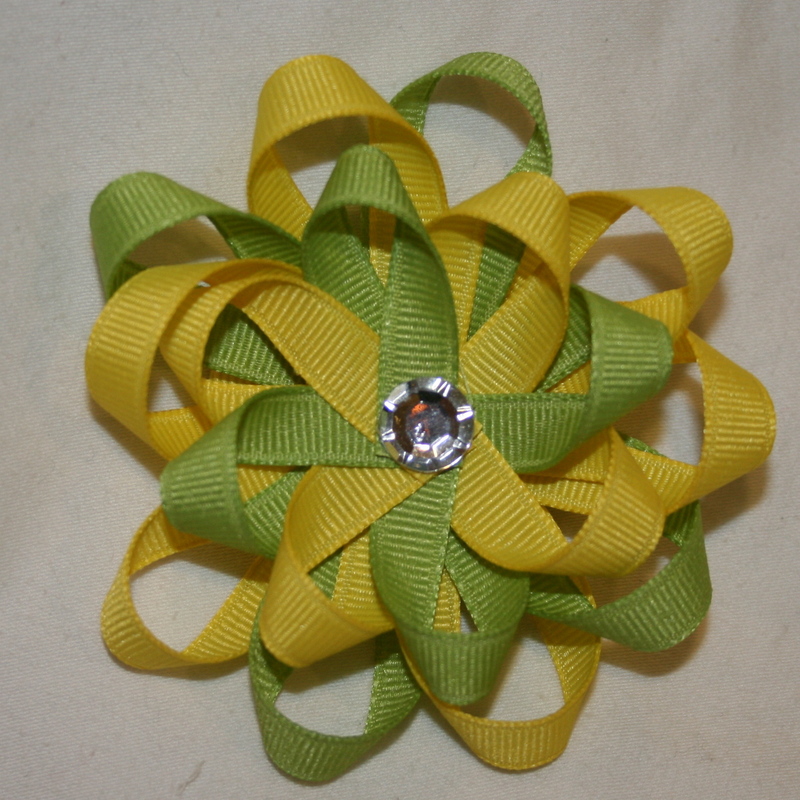 Once the layers are stacked, add the embellishment to the center using hot glue and attach the bow to a partially lined hair clip using hot glue. I like to put the bow upside down, apply the glue to the top of the clip and then turn the clip upside down and press it onto the bow. Make sure you hold for 10 seconds so that it is secure. Here are some finished bows. 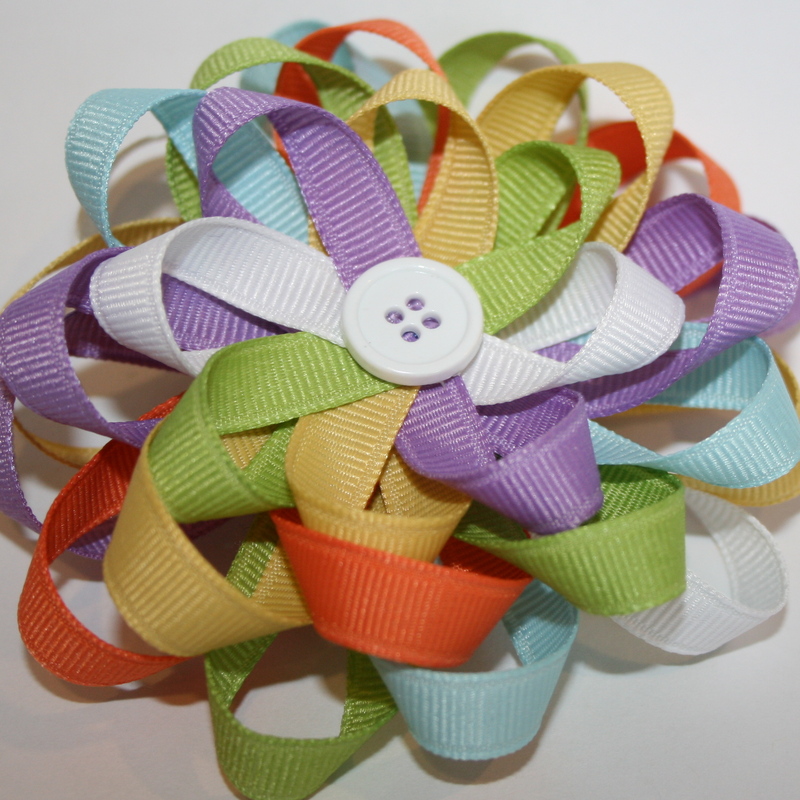 I love playing with different colors and using lots of different ribbons. 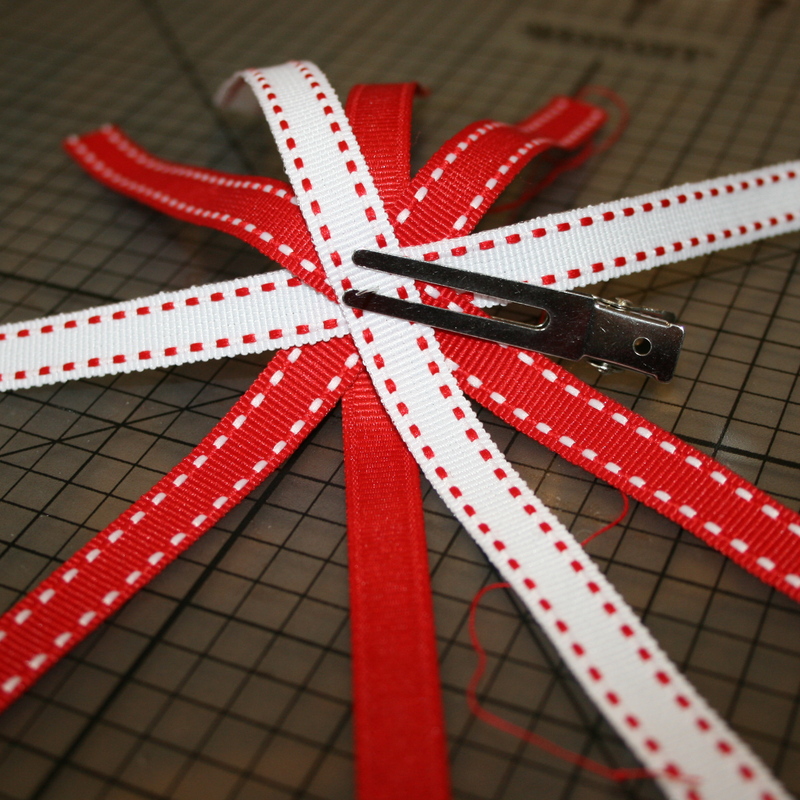 With regards to printed ribbon, I prefer very simple- Swiss dots, saddlestitch or stripes- but that is a personal preference. You’ll quickly develop your own style! To do a third layer, you will need SIX 9 inch strands of ribbon. I used a simple white button for this bow but this is where you can get even more creative. A wonderful source for custom made embellishments is Green Meadow Clay. 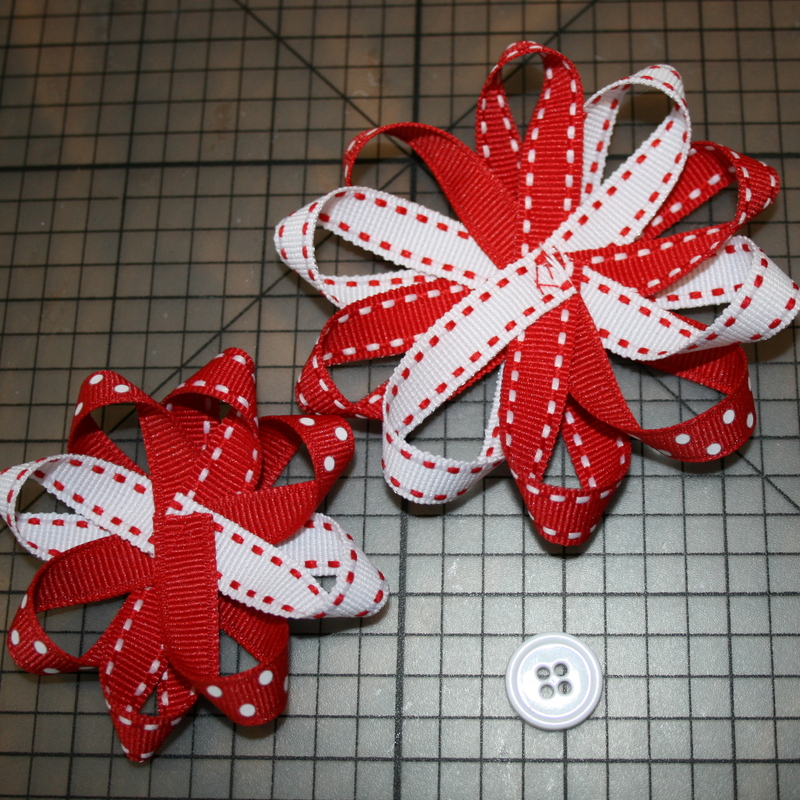 Christene makes amazing polymer clay centers for hair bows. This is a wonderful way to tie in the hair accessory with the outfit or the theme of the party dress! Wouldn’t this ladybug that she made look really cute in the above bow? 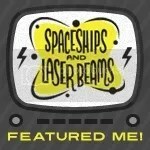 Great tutorial… I love the step by step… nice job! At the end of step #4, you say to not remove the needle…so is it supposed to be pulled all the way through?? No. You don’t need to pull the need through all the way at this point. 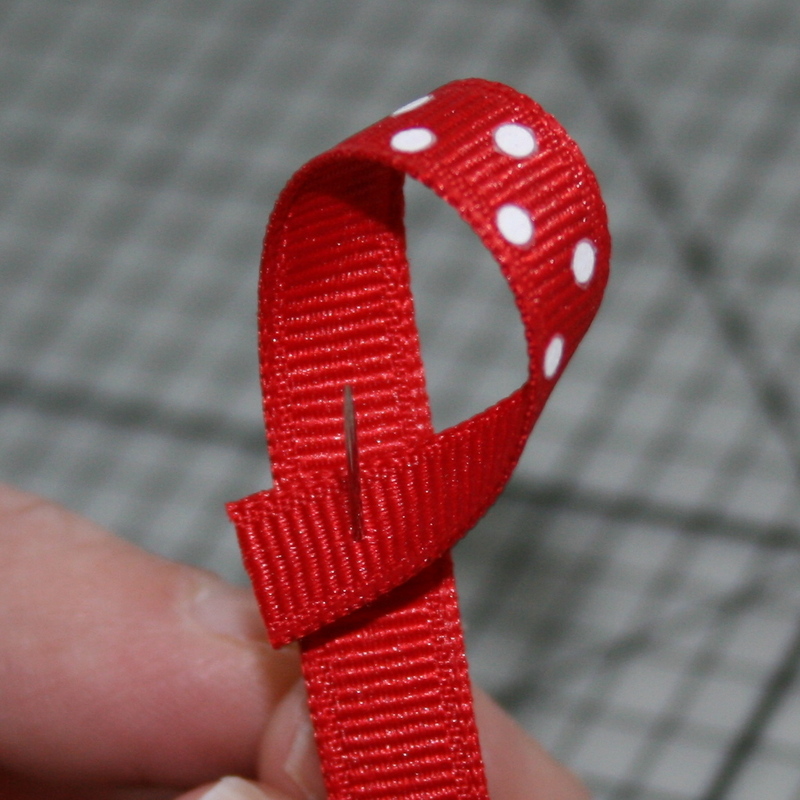 Whilst you are fanning out the ribbons, you’ll want the middle part of the needle holding all the ribbon together. You’d have less control if you pulled the needle all the way through. The photo is a bit small but if you zoom in, you can barely make out the tip of the needle against the alligator clip. Hope this helps. My best advise is to try it out and play around. Enjoy it and you’ll quickly get used to making these cute hair bows.